At Bought By Many transparency is important to us. We know people are concerned about the amount of data held about them and what it is used for. One reaction we see on social media regularly is: ‘I was going to join but you wanted access to all my Facebook data’, so we thought I’d explain how we use the data to make the process of joining easier and to let you know we take information security seriously. 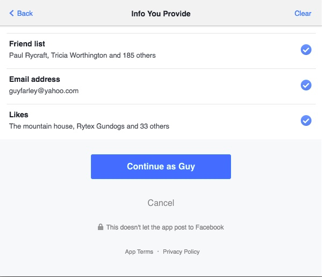 Of course, you do not have to log in with Facebook - any other social login or an email and password is fine - but many people choose to use it because it is so convenient. Most members come to us from posts they have seen on Facebook. If they then log in with Facebook they do not have to create and remember a new login and they don’t even have to input their Facebook login details (because they are already logged in). And because we get some data about members from their public profile we can pre-fill some fields on forms when they’re getting an insurance quote. 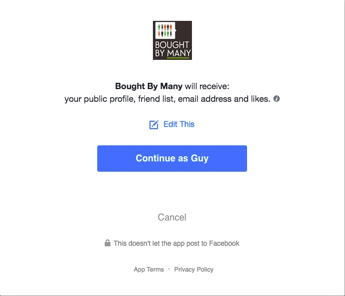 When you log in with Facebook on Bought By Many you will see a box that tells you what we will be able to see when you log in. At the bottom is says: ‘This doesn’t let the app post to Facebook’, which means we cannot put anything on your timeline, or that of your friends. If you click on the ‘Edit This’ link it gives you the option to deselect all the requested data except the public profile. Friend List - Accessing the list of your friends allows us to show you whom of your friends is already a member of Bought By Many and therefore provide you with some reassurance that people you trust, trust us. Email Address - Your email address allows us to contact you in the future. We do this for two reasons: To notify you of important events, for example, to send you policy documents or let you know your policy is due to renew. And to let you know about offers and products, of ours, we think you might be interested in. You can unsubscribe from these emails if you like. We never pass your email address to anyone else. Likes - By collecting likes we are able to more accurately send offers we think you might be interested in. For example, some dog owners also own horses - we can see this from their Likes. If we were to launch an equine insurance policy we would email those people to let them know about it. This capability is in its infancy for us but we hope it will help us to reduce emails that are not relevant to you. Bought By Many is regulated by Financial Conduct Authority (FCA). We, at Bought By Many, work to the principle that we will not do with your personal data, anything that we would be unhappy about another company doing with our personal data. You need to decide if that is a restrictive enough for you and if you trust us to adhere to that principle.